Biofinity is a high performing silicone hydrogel soft contact lens and is the most innovative material available in soft contact lenses. Softer and higher water content than other silicone hydrogels promotes a more comfortable wearing experience. Patients with Astigmatism can now enjoy the unique benefits of CooperVision’s Aquaform Comfort Technology, found in the entire Biofinity family of lenses.Creates a naturally hydrophilic contact lens that retains water, within the lens, which minimizes dehydration and promotes a more enjoyable lens wearing experience. Highest oxygen characteristics of any toric lens available for healthy, white eyes and extra long wearing times that many patients experience. Light blue visibility tint for ease of use and easy to recognize if lens is inside out. The #1 doctor prescribed toric lens in a monthly replacement schedule. Continuous wear for 6 nights/7 days. Unique and innovative design for presbyopic patients. Highest oxygen level of any multifocal contact lens provides excellent health and cleaner, whiter eyes. Least deposit resistant material available in a silicone hydrogel means less cleaning and more comfort. 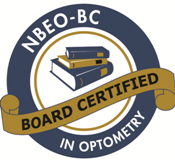 Utilizes CooperVision’s patented Balance Progressive Technology for excellent vision at near, far and everything in between. Perfect lens for patients who spend a lot of time in front of their computers. Excellent “at arm’s length” vision. Comfort and sharp vision at all distances has made the Biofinity Multifocal the #1 doctor prescribed multifocal for new wearers. Patented PC Technology creates a unique lens material that attracts and maintains water, keeping the lens moist and comfortable all day long. 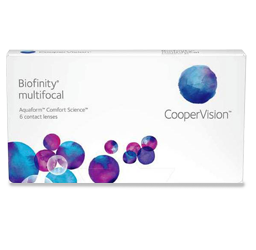 Features the only lens material with an FDA – cleared indication relating to improved comfort for those who experience dryness or mild discomfort during lens wear. #1 doctor prescribed lens for patients with dry eye related issues. Material retains 96% of its water content over a 15 hour period. Less dehydration means a more comfortable lens at the beginning and end of your long day. Wear what doctors wear. Most doctors personally prefer the convenience and health benefits found only in daily disposable lenses. Proclear means “comfort”. 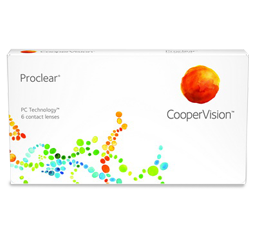 Along with the same material attributes found in Proclear sphere lens, you can now upgrade to the convenience of a daily disposable lens. No solution means you save on average $100 per year in solution costs. 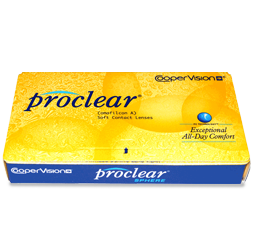 No lens cases or solutions to carry around makes the Proclear 1 Day the most convenient lens available. Simply discard them at the end of the day. A Fresh new lens every day. Ideal for sports enthusiasts, athletes and teens. Features aspheric optics designed to block both contact lens and corneal aberrations resulting in crisp, clear “high definition” vision. Patented molded round lens edge reduces eyelid interaction – resulting in continuous wearing comfort. Available in convenient 30 packs for the occasional wearer or 90 packs for the every day wearer.